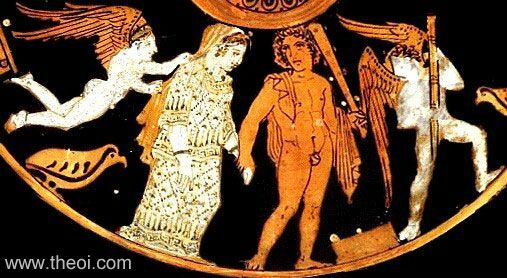 The apotheosed hero Heracles leads his bride Hebe in a wedding procession through Olympus. They are flanked by two Erotes (love-gods)--Eros who holds Hebe's veil and Hymenaeus who leads the procession with a flaming torch. Other figures in the scene (see other image) include Athena, Hera and Zeus.